Rapid development of the State has resulted into a sharp increase in water demand and the most accessible water resources, such as rivers and shallow aquifers are now almost entirely committed. Alternative water resources are therefore imperative to meet with the ever increasing demand. With the increase of water usage, the volume of sewage also increases and safe disposal of sewage has become a cause of concern. The appropriate reuse of treated sewage is the obvious and eminent solution. It is the most preferred approach as many parts in the State are not having suitable surface water sources. If wastewater reuse is exercised properly, the benefits that can be reaped are great and will far outweigh any associated costs. To achieve this concept, eco-friendly, viable and integrated system of waste management is required. At Present, 162 ULBs of the State generate about 2000 MLD of sewage. A Very few Municipalities are having sewerage network and due to absence of treatment facilities the sewage that is generated and is discharged into the soak pit/septic tank or into the nearby rivers/streams. All such non-scientific practices of sewage disposal lead to pollution and contamination of ground water, surface water and land. 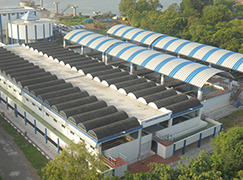 Some of the Municipal Corporations have Sewage Treatment Plants (STP) in operation, wherein the sewage is treated up to the secondary level and ultimately discharged into the nearby water bodies. Capital costs are low to medium for most systems and are recoverable in a very short time; Also Operation and maintenance are relatively simple except in direct reuse systems where more extensive technology and quality control are required. Provision of nutrient-rich treated sewage can increase agricultural production in water-scarce areas. Pollution of rivers and ground waters may be reduced. In many cases, the quality of the treated sewage could be superior to that of well water.